IT HAS EMERGED that some rural parts of the north-west could have to wait as much as another 6 years for the roll out of broadband. The National Broadband Plan – which looks at extending broadband into areas that currently do not have coverage – will be rolled out from 2016, with its full installation expected to be completed over a three- to five-year period – potentially going into 2021. However it has been stated that 2021 is a conservative estimate and the project could be completed prior to that. This information was disclosed by Minister for Communications Alex White in response to a parliamentary question from Independent Donegal TD Thomas Pringle. Minister White’s Department is predicting that over the next 18 months around 1.6 million of Ireland’s 2.3 million residential households will have broadband. The North West Region, which covers Donegal, Sligo and Leitrim, has 83,935 that will be covered by the National Broadband Plan. A map dividing the country in blue and amber areas is available on the Department of Communications website – with blue representing areas that will be covered by commercial providers and amber areas. Together these show where the National Broadband Plan is being implemented. Speaking to TheJournal.ie about the potential delay to the roll out of broadband, Tim Bechtold, who runs ‘The Lobster Pot‘ with his wife Anne in the Donegal village of Burtonport, explains the difficulty with the lack of access. “If I can’t upload video and show people what’s going on down here, which is the case right now – it is very difficult to send any of that information out to the customer, you’re missing the boat and you’re not telling the story,” he went on. Burtonport is covered by the Eircom Broadband roll-out plan and is expected to have broadband installed by the end of the year. An employee from Phil Bann’s shop on Arranmore Island said that locals were still depending on dial-up access and that reception could be “terrible sometimes” – but that they were hopeful broadband would be trial on the island next year. In a statement the Department of Communication has said that under the current commercial investment plans, 1.6 million of the 2.3 million addresses will be covered by commercial broadband while around 700,000 addresses will require State intervention. Read: Why aren’t the Irish protesting? A question that was being asked a few years ago. Not anymore. 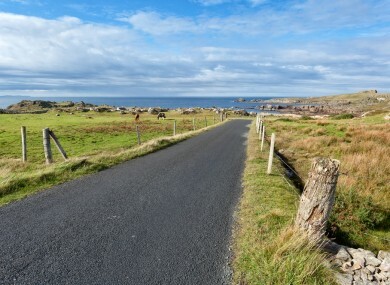 Email “Donegal could face a bit of a wait for broadband ”. Feedback on “Donegal could face a bit of a wait for broadband ”.